Dubai, UAE, April 30, 2018: The skin, like the brain, is a living organ, and the effects of stress on its functioning are severe. In fact, studies indicate that stress causes a decline in skin barrier function.The prolonged release of stress hormones in the skin causes a decrease of Hyaluronic Acid production, contributing to the breakdown of collagen and overall cellular aging. Loss of collagen, loss of elastin and depleted Hyaluronic Acid share a common side effect: an increase in fine lines and wrinkles. Pro-Collagen Overnight Matrix has a smooth gel-cream texture that glazes over the face, creating a protective matrix that mimics the skin to seal in hydration, helping to prevent trans-epidermal water loss. When you drift off to sleep, its Drone Peptide Technology goes to work, targeting areas of the face where stress shows most. Our goal with was for you to wake up to beautifully hydrated, younger-looking skin. This fan-shaped translucent algae, sometimes called “Peacock’s Tail”, is known for its anti-aging benefits and is the hero ingredient in the ELEMIS Pro-Collagen range. It was discovered on a shipwreck; underneath the algae the ship’s wood seemed to be preserved, as though time had stood still. Padina Pavonica helps improve hydration, leaving skin feeling firmer and looking more youthful. Pro-Collagen Overnight Matrix contains a highly purified extract from the Microalgae Dunaliella Salina, which naturally grows in salt lakes with a salinity nine times higher than regular sea water. Exposed to harsh environmental conditions, the microalgae produces high levels of energy through photosynthesis. Microalgae helps the complexion appear more luminous and fresh-faced. a sustainable flowering plant in the pea family. They help to promote relaxation and a sense of well-being. A blend of Geranium, Peppermint, Lavender, Chamomile, Eucalyptus, Ho Wood, Orange, Clove and Lavandin provides a beautiful, soft aroma. 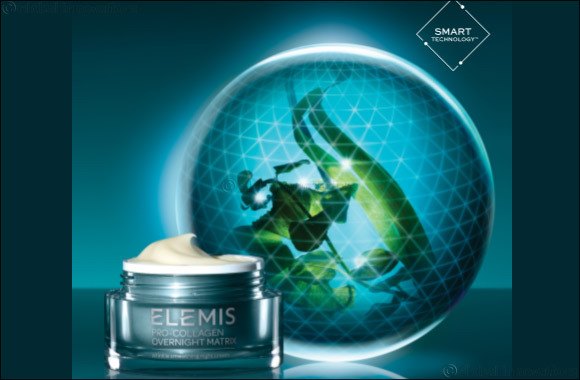 ELEMIS Pro-Collagen Overnight Matrix will launch in Middle east in June 2018.